Well the fishing on South Bowen from Cowan Point to Roger Curtis continued to be good this past week. Saturday in particular was very good, Sunday was slow, but then it picked up again mid week. The chinook, and now plentiful coho, seem to be full of anchovies for the most part. The bait has been fairly shallow and so are the salmon. Hot depths have been 20-80 on the riggers with 35, 45, 55, 65 being hot. Try shallower when it is overcast and deeper when it is sunny. Productive flashers have been the gold or silver Betsy or Super Betsy, Green Onion or Green Onion Glow, Purple Onion or Purple Onion Glow, UV Jelly Fish Yellow Green Kinetic Mist aka Club Dub or Club Dub Glow, and of course the Salty Dawg. A 6 foot leader to an anchovy has been hard to beat. On your shallower rods use a UV Purple Haze teaser head or a chrome green and chartreuse teaser head. On your deeper rods use a glow teaser head like a Bloody Nose or glow green and chartreuse. Spoons have also been working very well. A 3.5 or 4.0 will represent the bait well. Any good spoon l like a Kingfisher, Oki Titan, Pesca, Gibbs Skinny G, etc will all work. Some of the favourites this week have been Cookies and Cream, Irish Cream, Mojito, Gut Bomb, and Clupea. Others have been doing well on hootchies but I have mostly been running spoons and bait. A white UV hootchie with a 28 to 32 inch leader is a good choice on your shallowest rod as there have been lots of coho around and they love that hootchy. It will work for chinook as well as witnessed by me personally when a colleague landed a 31.2 pound chinook hooked at 60 feet on a white UV hootchy last Saturday, right next to our boat. Nice fish Paul! Most of the chinook have been 10 to 20 pounds and there are lots of undersize but there are a few slabs swimming around so make sure you leaders are in good shape after releasing numerous small fish. 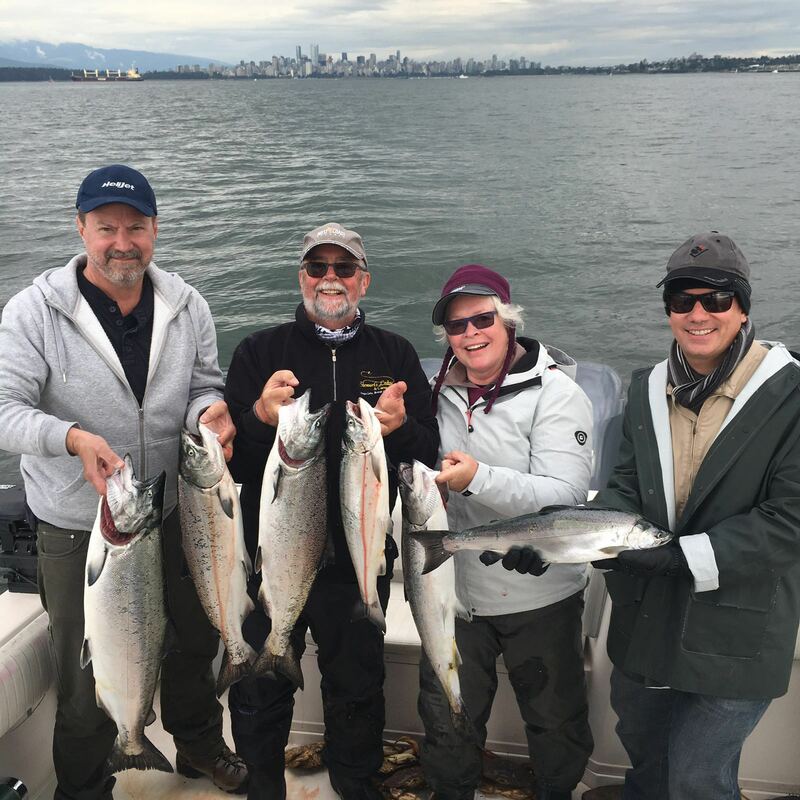 Four chinook and two coho from South Bowen. We haven’t heard too much from Thrasher. The fishing on this side has been better for the most part or it has been too windy to get across. It is tempting to make the run across as we have had such good fishing there this time of year, but leaving fish to find fish is usually not such a good idea. If you are heading over this is the time of year we start to fish the structure. This means you are often fishing deep, like 140 to 240 on the downriggers so we suggest 18 pound cannonballs, glow flashers, good glow spoons like a Pesca and double glow flashers from Oki. This is some fairly technical fishing and we have all of these items at the shop if you need to get setup for fishing deep. Hootchies also work well and we have all the hot glow hootchies in stock like the OG140, OG142 and Double Skirts in chartreuse. I love going to Thrasher, so if the winds die down I will probably head over. There is almost nobody there because the local fishing has been so good. One afternoon this month I fished it, got a few nice ones, and we were the only boat there. Mastering Local Saltwater Salmon Students on a successful day on the water. The Cap coho are here in force. 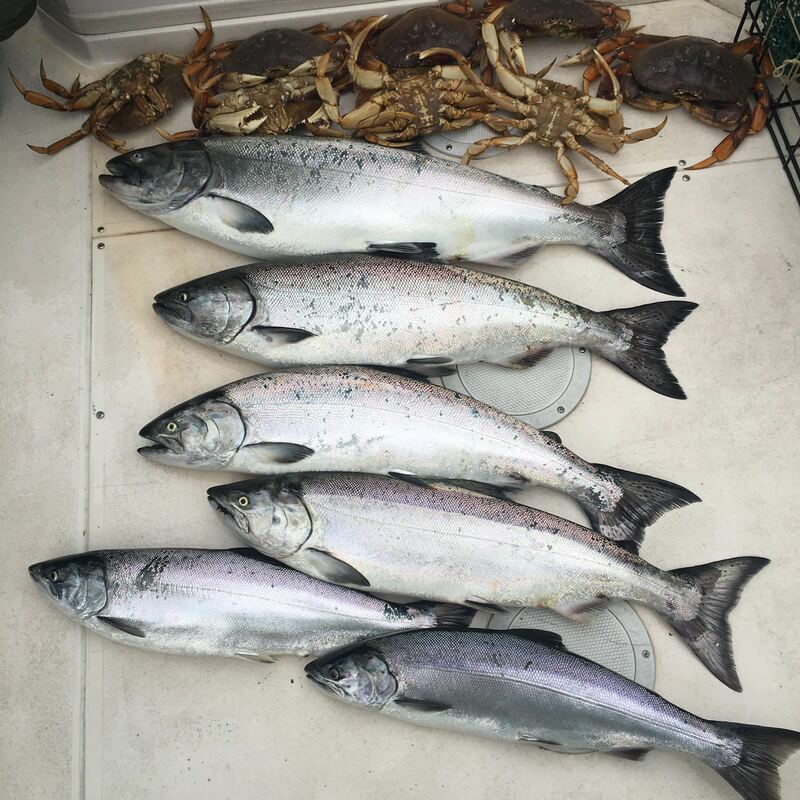 There have been lots caught off Bowen and there are lots in the Capilano River as well. There have been confirmed reports of fish taken trolling off Point Atkinson also. If chinook fishing is slow this is where I would go as a back up plan. White UV hootchies, 28 inch leader, to any of the flashers mentioned above, and you are in business. Keep your gear from just under the surface to 40 feet down and you are in the productive zone. With all the local chinook around and bonus coho action, now is a great time to book a charter. 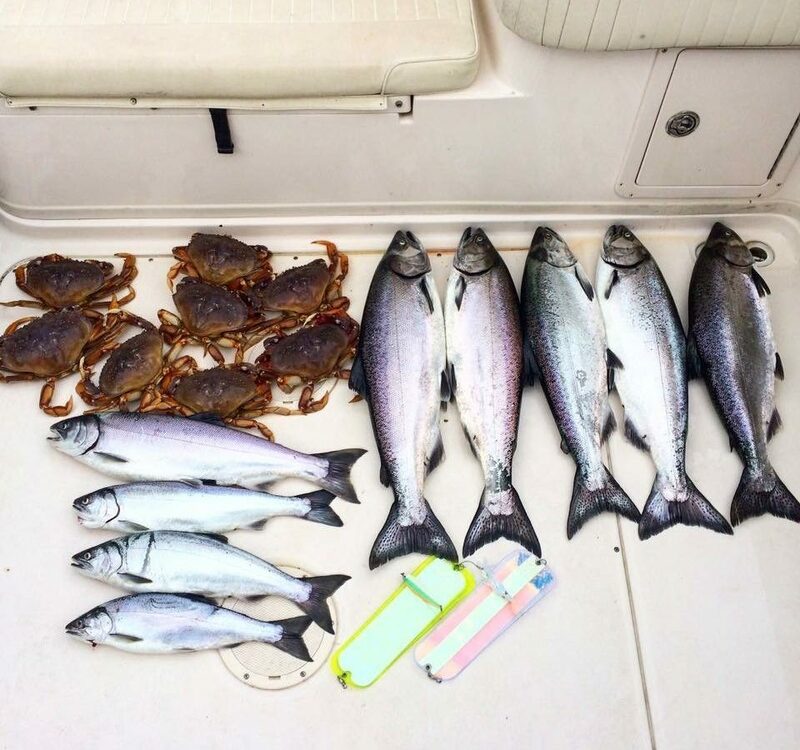 Although we had one or two slow days last week, for the most part we had excellent catches. Just look at the pictures from this week! To book a charter call Luis at 778-788-8582.